The Meat Center, as discussed the other day, is a most definitely unique place on campus, where you can buy real cuts of meat (lamb, pork, and beef) as well as dried meat products (the jerky is famous, but do try the dried sausage). It's also good in the sense that it wasn't outsourced with the rest of the establishments (A meal plan never could be used at the meats center (and most certainly not today), but a long time ago, there was more than Aggie-butchered meat you could buy. It was also ice cream! 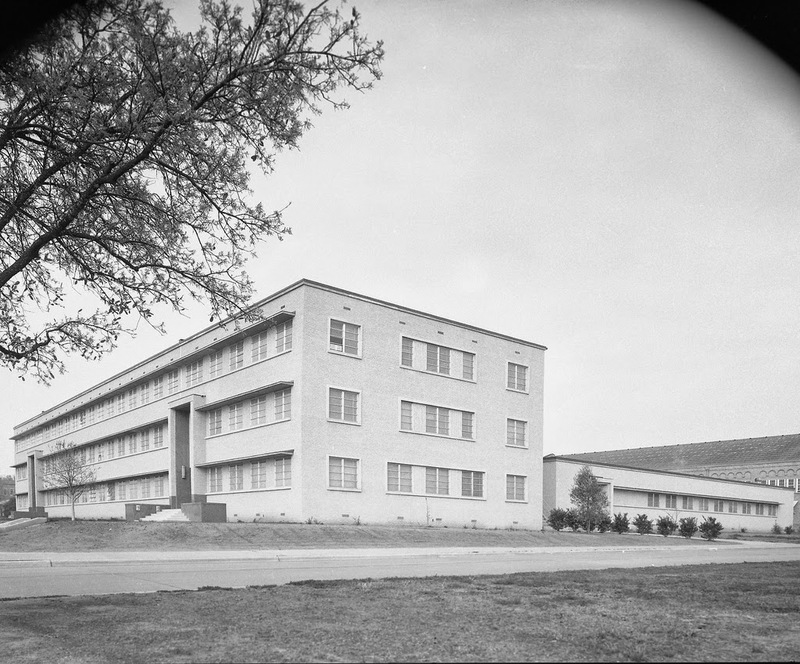 The "Dairy Science" building (also dairy sales) was located on Spence Street between modern-day Heep Laboratory Building (not Heep Center, that's different) and the Pavilion. 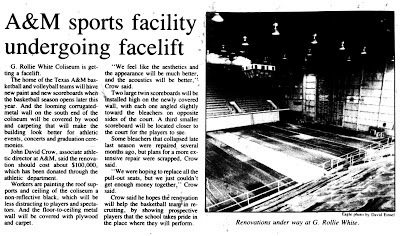 There was also an older "Creamery" (that physically looked a bit like the Pavilion) that was demolished on West Campus in the mid-1980s (right on the other side of the railroad, where Old Main is today...yes, it even remained after the semi-circle of Olsen was built, and all that). That is not the subject of this post. 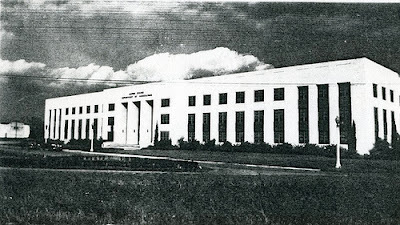 The dairy manufacturing building (the Main Campus one, at least) was demolished in 1995 for what would eventually be the Central Campus Parking Garage (the facade was where the main entrance off of Spence is). Just a few years prior, the dairy had been featured in Southern Living as part of a small page on Texas A&M with a small picture of the dairy/creamery's inside. While this article is still framed at the Meats Center, it has faced the window for years (thus, becoming quite faded) and the picture was never very large anyway. If you know of any interior pictures of the building featured in this post, please tell us. It wasn't a spiteful move that the dairy manufacturing building was demolished, though, as a new modern creamery building was built soon after on Discovery Drive, in West Campus. However, the facility was never actually used as a dairy manufacturing plant since another group needed it more and the dairy group lost funding. It's still a bitter issue to this day for many involved. This turned out to be the Electron Beam facility, a food irradiation facility that partnered with a private company called SureBeam. Unfortunately, food irradiation in general never took off because "consumer safety groups" (read: professional scaremongers) convinced the public with the false notion that food irradiation was bad ("it has radiation in the name! oh noes!") and SureBeam paid the price for it (going bankrupt in January 2004). After a second short-lived partnership with another food irradiation company and some internal shakeups that resulted in a lot of the TAMU employees leaving the facility, the electron beam facility was never utilized properly again. Hopefully we can get back to the electron beam facility another time, but the real end point was that A&M didn't have a creamery after the demo, and thus, no homemade ice cream. I don't even know if you can get Blue Bell on campus anymore: I haven't been inside Sbisa proper in at least a year, the two places that served Blue Bell: Common Grounds and Bernie's Café, have both closed. The thing that burns the most is that LSU does still have a creamery and serves it at campus dining location (and yes, they too have Chartwells doing the dining). Are we going to let LSU make their own ice cream without having our superior version? A sight you'll never see again! 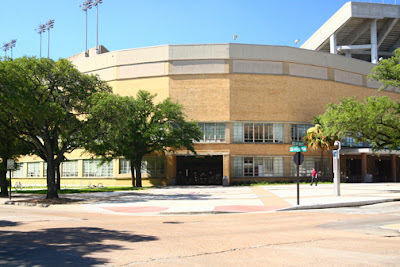 No pictures are enough to replace G. Rollie White Coliseum or the Read Building (built 1954 and 1985, respectively), but I do have some pictures (about three dozen) that I took with a friend at the end of last semester. It was an odd experience: some offices and rooms were stripped, giving a true "urban exploration" experience, but some weren't (people taking finals, for one). G. Rollie White Coliseum was two levels (an arena and a smaller upper level), with Read Building being four (second level of Rollie is Read's third). Read is connected to the lower Kyle Field decks. 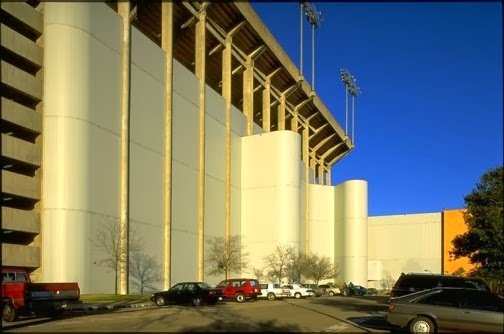 These will all be demolished for the "new" Kyle Field, which is a shame but now is not the time to discuss what the TAMU brass want (you can explore it in the comments, I won't censor). You can see the pictures I took on Flickr. 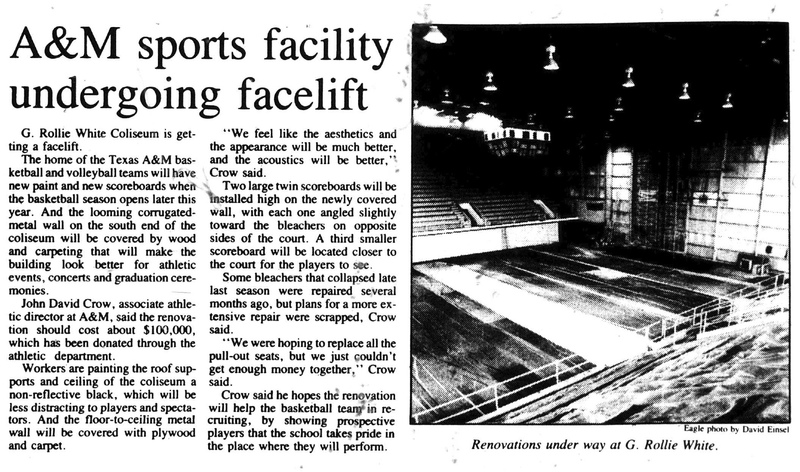 As a bonus, here's an article from October 1985 detailing renovations to G. Rollie, which was probably done in conjunction with the Read Building expansion. You can see the pre-renovated arena here. Read Building wasn't much to look at, as it was cleverly disguised as part of Kyle Field. 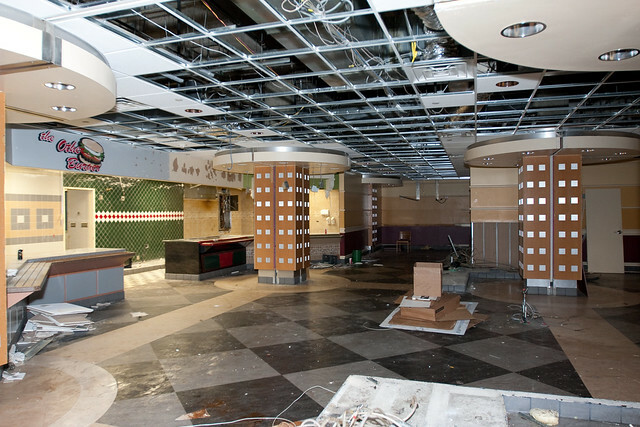 10/24/13: updated to account for their demise, changed photo -- the new one is from AggieMap.tamu.edu (as well as for Read), which have since been removed. The old picture from this post can still be seen on Flickr. 12/18/13: A different angle has the Read Building gutted to a shell in late September. At this point you could see the original paint on the walls. During my time at A&M, I was thankful that I had enough sense to photograph many buildings on their way out in terms of demolition or extensive renovation. I didn't get enough pictures of the old Scoates Hall, and no inside shots of Dulie Bell, but did get pictures of The Commons, Zachry Engineering Center, Read Building, G. Rollie White, and of course, these. Today, these are largely gated off as new parking garages and structures take the underutilized space, but this is about the space that was there, University Apartments. In here, I may mention Southside, which in previous versions of this post was presumed to be at the northeast corner of College Avenue and University, may not have been the case. I explore this in a section at the bottom of this post, and will talk about it at the end of this post. All the other mentions of Southside will be as my research has shown, thanks to research at the Cushing Memorial Library. Originally rows and rows of two-level Army-style barracks filling up the diagonal-row roads in the early 1950s, with two complexes, College View and Southside, a federal grant in 1957 (to the tune of 2.5 million dollars, which would be about 20 million today) allowed more to be built. In 1960, the Hensel Apartments (later Hensel Terrace Apartments) were built, and originally not air-conditioned (until likely the 1970s). The new College View Apartments, built in 1969, were built facing FM 60 and according to The Battalion were "cool, comfortable, and complete", being climate controlled at 70 degrees. The old College View apartments were later disassembled. Interestingly, because the new College View apartments were much denser, a good portion of the land was NEVER utilized again. In 1989, Texas A&M acquired some 1950s duplexes in the Oak Terrace neighborhood, north of the University Square shopping center, with the buildings being on Dogwood, Cross Street, Milam Avenue, and Culpepper Drive. These were the "Tortilla Flats" duplexes (likely named after the run-down district in Tortilla Flat), a dilipidated collection of duplexes which were going at half the rate of the rest of the housing in the area (rent was $200/month) and in terrible condition: sub-standard plumbing, leaky roofs, rotting floors, and one can only guess how bad the wiring was. In 1991, Texas A&M evicted all 110 residents and demolished the homes soon after. They also said that the 13-acre tract would be put to use soon, and if not, sold. That didn't happen. It would be eventually leased to developers to build U Centre at Northgate, which would open in fall 2014...nearly two and a half decades later! As time went on, the Married Student Housing became known as the "University Apartments", as it started to become known for international students as well. The maintenance of the apartments declined and the apartments started to deteriorate, but there wasn't any major trouble. Piecemeal improvements were made to the complex, including the addition of the Becky Gates Children's Center, a 1997 addition on Hensel that would have childcare for students married with children. Later on a community center and playground were built as well. However, it was an incident in 2004 that did change the University Apartments forever. One day in July 2004, residents complained about a smell of natural gas in the Hensel Terrace Apartments. The maintenance worker responded but decided to not repair the leak until the next week (in fact, they told residents to close their windows, thus making the smell inside worse). Saquib Ejaz, a resident of those apartments, lived with his wife and daughter at Hensel Apartments. His parents were visiting from Bangladesh. While his parents, wife (who was pregnant with another child), and daughter were home, the gas somehow ignited and fire consumed the apartment's interior, severely burning all four. His wife and father survived, but his daughter and mother did not. Other apartments were damaged, as well, however; the structure itself survived. Lawsuits were filed, and by 2005, a number of new improvements were announced, including new stoves, new detectors, and much better maintenance. This still wasn't "enough" maintenance, as the apartment complex was still falling apart, with the College Avenue Apartments on Ball Street having unleveled floors. However, by fall 2006, a plan was approved to add the Gardens at University, which, instead of building it on the Tortilla Flats land, or the area closest to Meadowland, replaced Hensel Terrace. When I first wrote this article in 2012, two-thirds of the Hensel Terrace Apartments (including the rebuilt apartments where Ejaz's apartment was), had been torn down and replaced with the Gardens. Nothing else had been altered since then. One of the last pre-Campus Pointe demos came in 2011, when the College Avenue Apartments started to come down (finally "leveled", it seems--yes, bad pun). In early 2013 Campus Pointe was trotted out again and approved. College View Apartments, Hensel Terrace Apartments, and Avenue A Apartments were marked for destruction--all residents had to move out. There were even stories of the mattresses being moved out first, so many had to make do with sleeping on the floor. Despite (presumably) assistance, the apartments all near campus had much higher rent, and both Northgate and Southgate had undergone some degree of gentrification. The demolition for redevelopment seemed to take a long time, for months, the abandoned apartments (speckled with graffiti) stood, then for many more months with just vacant land. Sometime during all of this, Campus Pointe was renamed to Century Square. Avenue A Apartments, which has eight units per building, four of which are seen here. College View Apartments. These face University Drive. Hensel Terrace Apartments. Most of these are already gone, including the unit that exploded in 2004. It's worth noting that the building wasn't actually destroyed. The apartments have concrete foundations and despite being old and run-down, are better built then similar apartment complexes of the same era. The Gardens at University Apartments. These will stick around. Interesting vents on the University Apartments Maintenance Building. NOTE 12/3/12: A footnote in Project HOLD ("Brazos Valley Chronology") mentions the last of the old Army surplus barracks were removed in '82...these were almost certainly the Southside Apartments. There's been some confusion about where "Southside" is/was. I've flip-flopped on this issue sometimes, but I believe that "Southside" probably really was at University Apartments (my original opinion), with the reasoning being this. There were originally houses at the corner of modern-day Wellborn Road and George Bush Drive, but they were far older than the post-World War II grants. 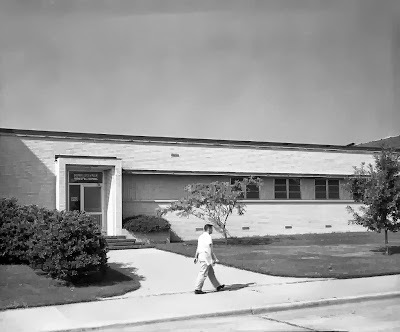 They were the "project houses" built in the late 1930s for poorer students, allowing them to raise livestock (pigs, chickens) to pay their way through college (there was an article on this on one of the TAMU-affiliated publications, but I just can't find it!). According to the chronology linked, they were torn down in the late 1980s, which is why there exists a color picture of demolition in front of pre-2015 Kyle Field (R.I.P.). If the last of the army barracks were removed in 1982, then that means that those couldn't have been from Wellborn and George Bush. The reality is, I just don't know, and would appreciate if anyone could give definitive information one way or another. Besides the rare snow, I couldn't find a picture of this building that wasn't decades old. Does anyone remember the Special Services Building? It was just north of Haas Residence Hall in the northwest part of campus, and from data on the Internet, razed in fall 2001. 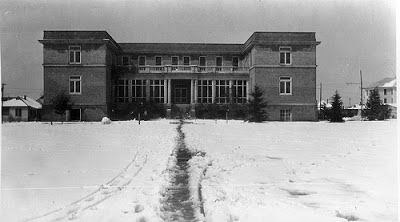 (It sits about where the basketball courts of the Hullabaloo Residence Hall now stand). Unfortunately, we have little information of this building. It was at least three stories tall and references on the Internet mention offices being located there. But what was it? "Special Services" is a rather vague term: I've heard it had laundry facilities, but that's about it. The main reason for demolition I remember it had creaking floors: so bad that it was deemed structurally unstable, with the furniture being abandoned. 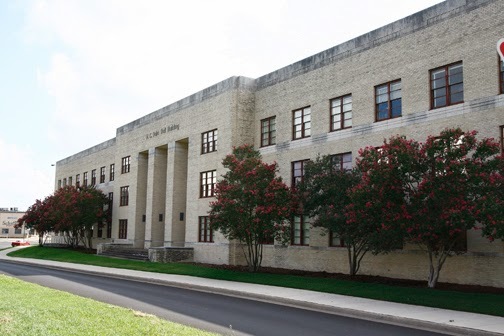 However, the "Special Services Building" reportedly dates back to 1914 according to this TAMU chronology. Is that right? I mean, most of the buildings back then were made primarily of wood and would've been demolished by the 1960s or 1970s, and it would be a miracle that the SSB survived for that long. Updated May 22 2013 with picture and new categories, and again in 2015 to add a caption.